STEAM Savvy is an all-girls after-school club for students at Gettysburg High School. The program encourages girls to explore science, technology, engineering, arts and math fields in which women are underrepresented. Instructors and mentors also assist students with college applications, interviewing skills, and other aspects of the college search, including visits to explore schools’ science departments. If you’re a Gettysburg High School student and you’d like to get involved with STEAM Savvy, contact chemistry teacher Kristen Bechtel. Why should we encourage girls to get involved in STEAM? Read more here! STEAM Savvy is featured on the YWCA USA’s Fresh@YW page! STEAM Savvy is made possible through the generous support from our Hallmark Sponsors. Find out how you can support STEAM Savvy and other women’s empowerment programs. 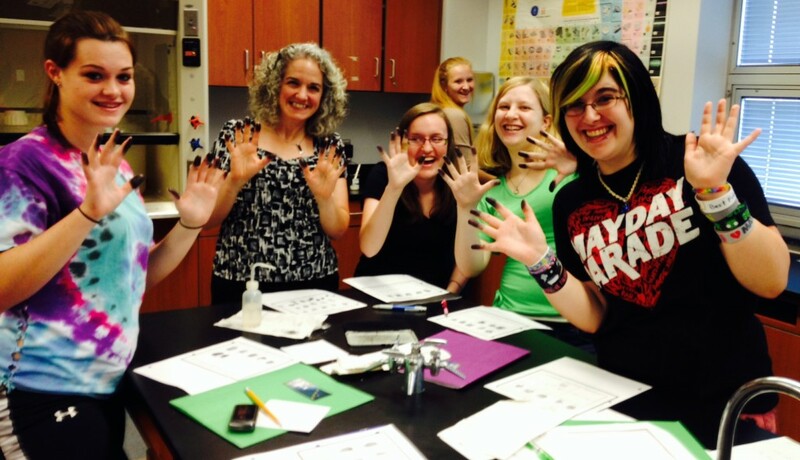 At left, club advisor Kristen Bechtel and girls in the 2013-2014 STEM Savvy program finish a fingerprinting lab as part of their focus on forensics. The following column was written by YWCA board member Jackie Milingo and published in the Gettysburg Times August 10, 2012. The mission statement of the YWCA includes a dedication to eliminating racism and empowering women. This mission is not only inspiring; it is a strong declaration of necessary social change. Based on 2010 data, the U.S. Census Bureau reports that half of our country is comprised of females (2011 estimate is 50.8 percent) and approximately 63 percent self-identify as “white.” This rough cut of gender and racial distribution naturally (perhaps naively) leads one to expect the same representation of diversity in the working/professional world, at all levels of education, at all income levels, and in various positions of power and influence. When we don’t see this diversity in action it begs the question … why not? Take the fields of science, technology, engineering, and math (collectively known as STEM), for example. Less than 20 percent of the STEM workforce is female (in many fields this number is closer to 10 percent). People from “non-white” racial groups, those with different levels of physical ability, and those who occupy the range of gender identity and sexual orientation make up an even smaller fraction of STEM fields at all stages of education, training, and employment. Despite the diversity of our country, all of these people are severely underrepresented in STEM. Why is this something to pay attention to? The STEM workforce houses a great deal of the knowledge and innovation required for our country to address the very modern challenges of living in a global community with limited natural resources. Increasing diversity in the STEM workforce not only empowers those who are so woefully underrepresented in these fields, increasing their economic, social, and political potential; it also injects a much-needed breadth of experience and perspectives to positions of power and influence. This ultimately benefits us all. The leaky pipeline into STEM fields starts early in our society. The number of girls (let alone other underrepresented groups) interested in learning about science, math, and their applications continuously decreases throughout middle school and into high school, thus creating a loss of diversity before these young people even enter college, professional programs, and the workforce. It is key to encourage and support interests in STEM during the formative years when competing social constructs, stereotypes, biases, and cultural beliefs can negatively affect a young person’s sense of identity and potential. Many of the Hallmark and Mission programs of our YWCA exist to support this cause. After-school and summer programs such as the LEGO Robotics Club and STEM Savvy Club, those that specifically target girls, provide a fun, low-stakes environment which can spark and nurture an interest that is then carried forward. Supporting diversity in STEM and the empowerment of all underrepresented groups requires the action of an entire community, and our local YWCA is a proud contributor to this effort. Jackie Milingo is an associate professor of physics at Gettysburg College and a member of the board of directors at the YWCA Gettysburg & Adams County. Contact her at 717-337-6076.